Last week I got the results from a recent blood test and found out that I have a cholesterol problem, which came as a total, utter, shock. A problem to the tune of 240 for an overall reading; 170 for the bad (LDL) cholesterol reading. It’s not like I’ve been eating 2 pounds of bacon dipped in mayonnaise daily or anything. My first reaction: WTF? I’m a healthy eater! I workout! It’s not fair! Second reaction: I got a little bit scared. What if I’m in the midst of a long lung-busting, heart-thumping climb and I have a massive coronary and keel over right then and there? I thought. No one should die wearing shorts with a big fluffy pad between their legs. 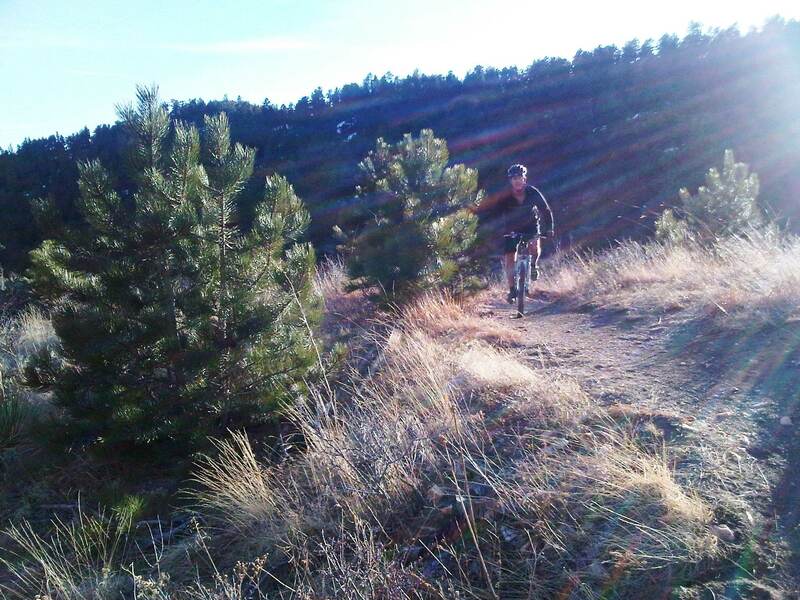 And then: on Sunday, March 20, while riding the Hogback/Matthews-Winters trails, my riding buddy Ed and I came to a particularly gnarly section that runs downhill toward Red Rocks. I came to a switchback that I never try to ride–I scoot up to it, then stop and dismount, then walk down–as Ed cruised around the switchback and kept descending. “You’re crazy, you’re amazing,” I said, because I sometimes see what he does and still I can’t really understand how he rides over the stuff he rides over. He’s really an incredible talent. Honestly. But then, something impossible happened. As I was walking my bike down the series of rock ledges, I heard a weird noise ahead. When I looked up, I saw Ed endo–his legs flying up and over, followed directly by his rear wheel. I could tell that he was going relatively fast (but not out of control) and he’d crashed. 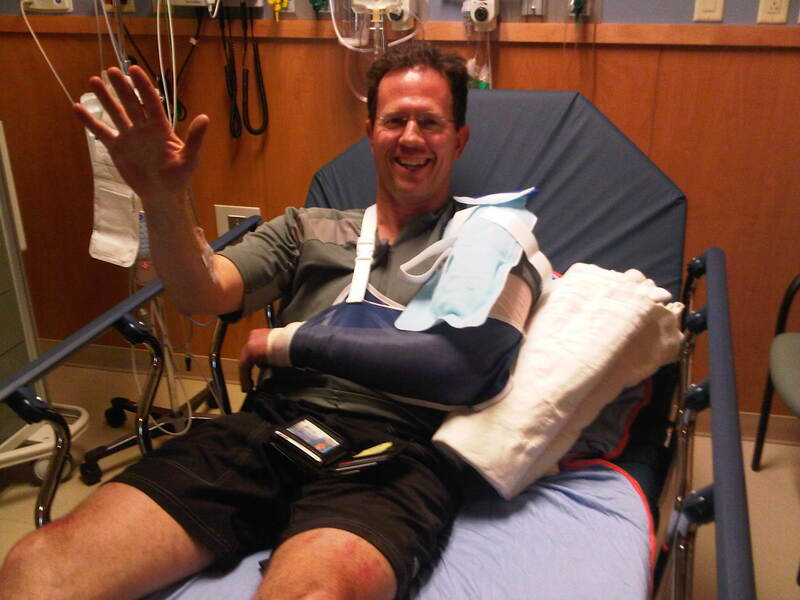 In 12 years of riding with Ed, I’ve seen him crash once. Until Sunday. He was alive–and conscious–when I got up to him, but he was grimacing and holding his left arm, which he said hurt a bit. He couldn’t move it, he said. The sound I heard during the process reminded me of the sound my collarbone made when I broke it skiing some 18 odd years ago. A gravelly, crunching sound, which was both cool and totally horrifying. I haven’t gone for a technical trail ride since, and I am wondering how it’ll go when I do. Part of me thinks I’ll be scared. Way scared. And tentative, which is always bad. And part of me thinks I’ll just be my old self–and if there’s a section that’s dangerous, I’ll maybe try it on the way up, and probably walk it on the way down, if I’ve never ridden it before. But then again, the stakes are high and I am suddenly more aware of that fact with everything I do (and eat, for cripessakes). I have kids, a wife, a mortgage. I’m getting older and am probably losing some strength, power, and flexibility. And I have freaking high cholesterol. I am, as the saying goes, trying to embrace my mortality, though I really don’t want to. It’s not the sweetest of hugs, I have to say. I’m popping my omega-3 pills and I’m wearing my helmet, that’s for sure. Here’s a pic of Ed in the emergency room. And here’s one of Ed a few days before, on a climb. Posted in Crash and/or Break. The other big question, what is Ed going to do when time comes for the next big trail ride? Maybe you can walk the ouuucky parts together. As to the cholesterol. I’m sorry. The wonk against the mortality wall bites. But those Omega-3 things help and you can even take other drugs, or medicine, rather, to help. You’ll be around a long long time. I just realized that I am, inadvertently, springing a little April Fool’s joke on my doctor. I had the most fat and cream saturated dinner I’ve had in months and months tonight. And a nice sugary cocktail. My annual blood work is tomorrow. I’m guessing I’ll be going back for a retest. At least if my numbers are high, I’m blaming dinner. Take care! Thanks for writing this blog — I liked it. Tough calls to make. Thanks for the note, Jan. I’m eating oatmeal and omega-3 pills like a fool, so we’ll see how it all goes.